Welcome back! Glad to see you have made it to Session 3! As the body is one, having many members, and all the members, while being many, form one body, so it is with Christ. All of us, whether Jews or Greeks, slaves or free, have been baptized in one Spirit to form one body and all of us have been given to drink from the one Spirit. The body has not just one member, but many. If the foot should say, "I do not belong to the body for I am not a hand," it would be wrong: it is part of the body! Even though the ear says, "I do not belong to the body for I am not an eye," it is part of the body. If all the body were an eye, how would we hear? And if all the body were ears, how would we smell? God has arranged all the member, placing each part of the body as he pleased. If all were the same part where would the body be? But there are many members and one body. The eye cannot tell the hand, "I do not need you," nor the head tell the fee, "I do not need you." Still more, the parts of our body that we most need are those that seem to be the weakest; the parts that we consider lower are treated with much care, and we cover them with more modesty because they are less presentable, whereas the others do not need such attention. God himself arranged the body in this way, giving more honor to those parts that need it, so that the body may not be divided, but rather each member may care for the others. When one suffers, all of them suffer, and when one receives honor, all rejoice together. Now you are the body of Christ and each of you individually is a member of it. "Okay, Okay," you are saying. "So what does this have to do with our trip to Peru?" Let's find out... watch the following video. Let's take this apart now. Let's look at each of the ministry areas in which the full-time missionaries are working on the ground in Peru. Discipleship ministries here can take many forms. We have cell groups and house churches meeting all over Peru and studying together to learn more about the Bible and about Christ in our lives. Currently, we have 3600+ people in discipleship cell groups, meeting in 6 of the 7 provinces of Peru. There are also house churches in the North of Peru studying the Disciple program, the Alpha program, and the Homebuilders program together. We also work to train Christian leaders in Peru. Several times each year (usually at least once per month) we hold Leadership Training retreats for people who want to become cell group leaders, for pastors, and for people who want to start new programs in unreached places in Peru. Through Community Health Evangalism or CHE our team is reaching out to people in the rural areas of Huancayo to teach them more about a kindgom life with Christ. The program reaches out to people in the community to help with development, micro-enterprise, health, education and bible study. The CHE program empowers the local Peruvians to improve both their physical and spiritual lives. There is also an initiative to help street children and children who cannot attend school due to economic challenges. The Kuyay Talpuy schools have been started to teach and support children and families who want an education and hope for a better life through education. The children attend classes, are fed a hot meal each day, and receive Bible teaching daily. Classes are taught by Peruvian certified teachers. Another project located in Huancayo is Leer es Creecer (“Reading is Growing” or “To read is to grow”) . This program is the first children's library in the Montero valley. The library is open to lend books to children and introduce them to reading. 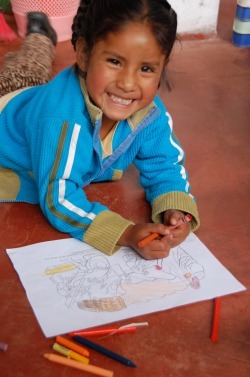 Known as Kid's Club to us in Peru, children's ministries are touching many lives here. Kid's Clubs meet each week in parks and fields and schools - wherever we can find space and children. Born from a missionary's personal testimony of not accepting Christ until she was an adult because of the lack of good Christian teaching in her childhood, she began to write lessons and teach other Peruvians how to lead children toward Christ. Today, Kid's Clubs are EVERYWHERE! A typical club will have 50-80 children who come together to sing and dance and learn about the Bible together. There is one club that has 150 children! Encorporating music, puppets, skits, large group and small group lessons, the Kid's Club lessons touch everyone in their learning style. Led by Peruvians for Peruvians, Kid's Club is a fabulous program! Led by Pastor Beto (Peruvian), a group of young musicians meets several times a week to practice and pray together in preparation for their praise band performance. This group also holds a music workshop on Saturdays to teach others how to play instruments and praise the Lord with their musical talents. The Music Ministry group has played in local city parks, a local "mall", at church functions, etc. They have even traveled and taken their mission on the road, leading retreats and concerts for Peruvian youth in the jungle. They were instrumental in closing down the discos/dance halls in one town and helping the church to open a Christian disco as a replacement. The Christian disco is a HIT and the youth of the town pack it in to praise the Lord with Christian songs and dances. When not open for dancing, disciple groups meet in the disco for bible study. praying with people who desire to know more and leading them into a relationship with the Savior. Every medical campaign has a Spiritual Area. Not only do patients receive medical care, but they also receive individual prayer support and attention to their spiritual well-being and health. Disciples from the disciple groups serve in the Spiritual Area, talking with patients, sharing their testimonies, and praying with them. Another example of Peruvian leadership - Peruvians lead Peruvians in prayer and into a relationship with Christ. Community Health Evangelism (CHE) is also used as an outreach to those in need of spiritual and physical health. Through the program, Peruvain workers spread the gospel to those in need. Did you know that YOU are one of our ministries here in Peru? We host 8-10+ short-term ministry teams each year. Short-term teams do a variety of things here, but the most important thing they do is PARTNER WITH OTHER MINISTRIES to build relationships and bring people closer to Christ. As full-time missionaries on the ground in Peru, our job is to facilitate those partnerships. We want to help you partner with other Peruvians and other ministries. We want to build relationships with you and walk together toward Christ. We want to help you build relationships with Peruvians so that together you can come to a better understanding of who Christ is. A key here is that you need to understand that you are one of MANY ministries on the ground here in Peru. You ARE NOT bringing Christ to Peru... he has been here for a LONG time and he is already working here, even before you arrive. I know what you're thinking... "Hey! Wait a minute! It sounds like this guy is saying that we shouldn't be going to Peru! It sounds like he is saying that we are just going to cause dependency among the people and ruin everything. It that really what he's saying?" Basically, the big DANGER sign is DEPENDENCY. His first point is "Do nothing for others that they can do for themselves." Those of us who are parents recognize this! If you keep cleaning your child's room for him/her, they won't ever do it for themselves - even though they are perfectly capable. They will just continue to rely on you to do it for them. Have you been there!? So how do we keep that from happening here in Peru??? Well, first, we work with existing ministries and with the Peruvian people. Did you catch those underlined words? The sentence doesn't read, "We ride in on white horses with all of our awesome tools and North American stuff and take the neighborhood by storm and fix all of their problems in a week while they sit on the sidelines and bask in our glory and marvel at our awesomeness." In the case of construction projects... we don't like them and are not scheduling any more of them at this time in Peru. We used to do them. And we tried to do them well -- we let the Peruvians be in charge, the Peruvians led the construction and taught us what to do and we were just here to provide labor and build relationships. The result - Lots of relationships were built, and all went according to plan, but it STILL managed to build some dependency problems that were not ever overcome. The short-term teams never saw it happening, but those of us who are left on the ground in Peru full-time feel the dependency daily! One church in particular looks to the full-time missionaries to do just about everything for them. It's not pretty, and it's not pleasant for us to try to break the dependency. In other words, we are VERY conscious of the dependency issue because we are living in the effects of it. Be careful and check your attitude... you need to be working with the people, not instead of the people. They need to be heavily involved and they need to be empowered to do things for themselves. The local Christians and ministries have laid the ground work for a new Kid's Club to be started in an outlying area. The leaders are trained and everything is ready. A short-term ministry team is coming in to help open the Club. They will spend a week helping the local leaders hold a Kid's Club every day - kind of an opening celebration week. They will be helping and supporting and generating enthusiasm in the village. It will be a great boost to the local leaders. Important to remember... the local leaders are THE LEADERS. We are just here to help and support. During our history here in Peru, medical mission campaigns have been a great boost to the local Christian movement and opened doors to further spread the gospel. In a small town in Peru, the small group of Christian leaders and disciples are having a rough time. They are being persecuted. The town is heavily involved in witchcraft and idolatry. It has been decided, based on historical performance of other medical teams, that a medical campaign in this area might be a great way to open doors and share the love of Christ and advance the spread of Christianity. So the existing Christian leadership has called in a medical team for this summer. There are many examples, but please know that your mission focus was decided upon by local Peruvians and Christian leaders. You are here to support them and build relationships with them, to be an encouragement to them. Point #3 - Undertake no project that is not sustainable by local people. Hmmm... he went after the medical teams, didn't he? Well, let's see if that is the case with our teams in Peru. First - we attempt to work WITH local medical personnel if possible. That takes the form of the local medical personnel inviting us into their clinics and giving us access to their facilities and staff. When we encounter situations that we cannot deal with because of complications or long-term care needs, patients are always referred to the local medical facility. We have relationships with the local clinics before we go in. It is important for us to come as learners, too... many USA doctors won't have ever seen some of the jungle diseases or issues that people in Peru have. We need to learn from Peruvian doctors and work together to learn more. On many of our medical missions, we have actually taken Peruvian doctors with us. This past year, we worked with a Peruvian doctor and a Peruvian dentist as they traveled with us into the jungle to work on medical missions. We also will not ever take a medical mission to the same area... we have actually heard of cases where local people had serious illnesses and needed to seek immediate treatment, but they wanted to "wait on the American doctors - they said they were coming back next year." VERY DANGEROUS - potentially deadly! We cannot, in good conscience, ever take that risk with people. We cannot go back into the same area and create a deadly form of dependency. They need to trust their own medical personnel and seek treatment. Dr. Whiteman is absolutely right... we need to do a better job of empowering local people and teaching/training them to do for their own people. We are working hard to incorporate educational components into the missions. For example, we have developed nutritional handouts in Spanish (and with no words - remember the literacy issues?) to help teach people about better nutrition, since the majority of our health issues can be traced back to poor nutrition. The same goes for basic sanitation and for safe drinking water issues. Education is key! What good is 30 days worth of vitamins if you never learn how to get them naturally from the foods you eat??? Vitamins are very expensive and the locals are not going to buy them... they need to learn how to do it within their means. Same with parasites... after 6 months, the parasite meds will be out of the system. If the people never learn how to combat the parasite issue through sanitation and hygiene, they will be in the same situation again - living with chronic diarrhea and malnutrition, etc. One of the career missionaries has been training a local Peruvian woman in health and nutrition issues and the Peruvian woman has been going to the churches to teach these lessons. Another missionary has been training local people in the Kid's Club lessons and leadership so that they will be the leaders and are empowered to lead their own ministries. Peruvians have been trained in evangelism and discipleship and have attended leadership training so that they can continue the work. The mission isn't over when you leave and go back to the States... Peruvians are carrying the torch and working long after you leave. Point #4 - Don't create expectations that will burden future missions in the area. Dr. Whiteman touched on something that is a guaranteed-killer for your mission... bringing a lot of "stuff" to give away. Trust me, after almost 10 years of leading short-term missions, I speak from experience. This causes so many problems in the community and among the locals that it can literally destroy a ministry. A short-term team brought baby diapers to give away to local mothers at the end of the Kid's Club ministry in Mexico. The very poor community of mothers began to swarm the USA team, grabbing and screaming for their free diapers. A riot broke out (you think I'm kidding... a literal riot broke out!). Women began fist-fighting in the street and pulling hair and throwing people down. Children from the Kid's Club ministry where trampled. The career missionaries were in a VERY bad situation - we were responsible for the safety of our team, but we were also responsible for trying to sooth the issue at hand with the community. Placed in the middle and scrambling to think fast, we had to protect the USA team and wisk them out of harms way, leaving the community to fight it out as the Mexican police swarmed in. A short-term team brought LOADS of materials from their church to use and give away during their mission. Most of the materials where old VBS materials from last summer, or Sunday school materials that were excess for the church... "What a great idea! We'll take them on the Peru mission. We'll give them to the locals and the ministries there." When the time came, the USA short-term missionaries decided to start handing out the materials (without clearing it with the career missionaries first). They decided that they knew that Jose is a pastor, so they decided to give it all to him. Jose was very happy! However, what the team did not know or understand was that there were 12 other pastors / teachers/ church leaders working with us during that mission, too. In other words, Jose was thrilled, but 12 others got their feelings hurt / had a need and a use for the materials / walked away insulted. While the team made one pastor very happy, 12 others were disappointed and relationships were damaged. "Where's my gift?" The children were gathered around the North Americans and all were looking up with anticipation. "Where's my gift?" The leader leaned over and said to me, "What gift? Were we supposed to bring them gifts? Our budget was really tight. We didn't bring the children gifts." I was left to explain that other North American teams have really over-worked the area (in Mexico) and they had come through with gifts and candy and lots of stuff. Now the children in this community equate North Americans with free gifts. It was a sad day for all. You have a lot to think about! Be careful. Make carefully thought-out plans before coming on this trip. Talk with your group and keep each other accountable to these principles. Now let's bring this thing home... Remember the verse at the beginning of this session? We read from 1 Corinthians about The Body and how every one / every part is important. Let's relate that to this mission... How are you important to this mission? In the video above, you saw that when you build relationships with other people, you get closer to Christ. After all, that was how Christ ministered - he was into relational ministry. He wanted to know others, to talk with them, to be with them, to teach them and serve them and love them. So, you will "fit" into this mission if you approach it from a relational standpoint. But let's take that one step further... How does your TEAM "fit" into the mission in Peru? Remember, you are just ONE of MANY ministries that are taking place here. Use the worksheet document below to think through this. You will need to print it out and think through the questions. Get with your team and talk this out. Brainstorm. Work together. THIS IS VERY IMPORTANT!!! How will your team work together with the other ministries and the existing Christian leaders to advance the kingdom??? Select the file to the left to download today's session notes and the devotionals for this week. That's it! Congratulations - You completed Session 3 !!! Don't forget to download your devotionals for this week and carefully, prayerfully read and consider each one. Your devotionals are an important part of your preparation! And they relate to these online sessions. You're more than half-way through the training sessions... Great job! Keep it up! Just a very short time until we all see each other in PERU!! !